Our 100inch Portable Movie Projector Screen is light-weight and can be folded in a small size . No crease left when you fold it . Also it is very easy to set-up with hooks and ropes . You could take it to anywhere and enjoy the happy movie time with families or friends at any time . 1.Compact One-Piece , Lightweight and Folding Design, Easy to Carry. 2.Anti-crease design. Wrinkles, please go away! Just hang it and turn on the projector ,you can enjoy your joyful time thanks to its high quality fabrics. 3.Thicker than others, its smooth surface results in sharper image and vivid color. 4.Support Rear Projection and Front Projection. 5.Easy to install and hang, suitable for indoor and outdoor. 6.Great choice for sharing wonderful time with families and friends. It could also work professionally on office, displaying company 's data or research. 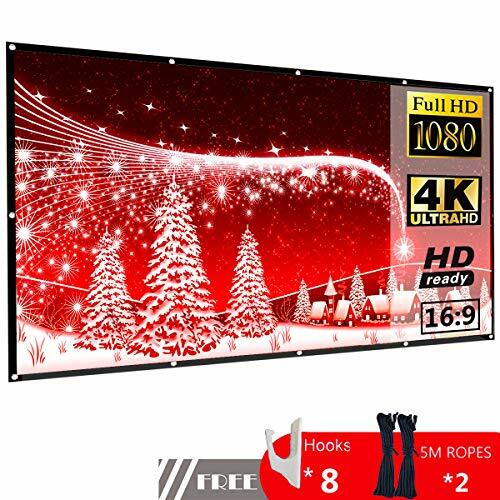 【ANTI-CREASE & NO WRINKLE 】 - This 100inch projection screen is made with high quality durable polyester material to ensure the screen is more smooth, sharper and brighter. No crease left When the screen is compressed or folded . 【FOLDABLE AND Light Weight】 - This portable projector movie screen is foldable without many heavy stand . It can be folded into small size and put it in your suitcase,backpack, bags or other cases ,carrying to anywhere you want. 【EASY INSTALLATION & Double-Sided Projection】 - Each P-Jing projector screen comes with installation accessories ( hooks, ropes ) to allow you an easy set-up on home or usual wall and outside yard.It is also able to be used for front and back projection. Both sides are clear and bright for great visual experience. 【EASY TO CLEAN UP】 - If the movie screen get dirty accidentally? Clean it as a usual cloth. You can wash this screen with water and soap, but it should better be hand washed, but not wash machine. 【WIDE APPLICATION】 - P-Jing projector screen is a 100inch big screen. It is an ideal choice for home theater, school classroom for education, conference room presentation, public display, outdoor movie and more . If you have any questions about this product by P-JING, contact us by completing and submitting the form below. If you are looking for a specif part number, please include it with your message.